I've long felt that the optimal bass synth was a single oscillator with a great filter. Minimoog enthusiasts threw feces at me for even suggesting that less than three oscillators was an acceptable quantity. I countered with discussions about phase cancellation, tuning irregularities and such stuff. 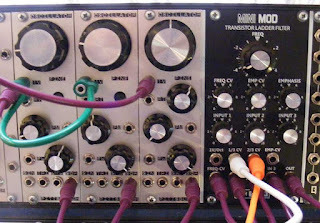 I finally got around to hooking up three discrete oscillators to the AJH Mini Mod's Moog-like mixer/filter, and my head is twisted. Not by pure bass (which I still think is benefitted by a single oscillator), but by plain ol' awesomeness. Damn, it sounds great, with a little clipping from the mixer, a nice bounce from a combination of the velocity and the key-follow, and a basic triple-unison tuning structure. Sounds a dream. So, my old friends, I come to you with half a hat in hand. 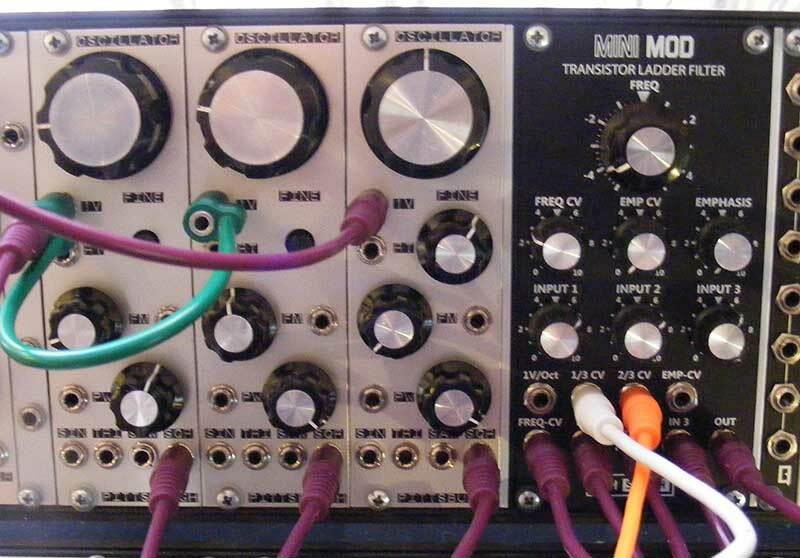 Three oscillators sound really nice. So do other quantities. Now get back in your mom's basement and make some more music! I dare you! Ok, let's hear a sound sample of that right there!